I have been procrastinating the SGR ride too, since last year. I never had an actual reason to get onboard and hit Mombasa. First of all, my idea of fun is very far away from coastal temperatures. When most people I know enjoy the beach and swimming. I don’t. It has been a running joke for years now, at work. How, when everyone was swimming I was seated in my coat. (LOL, of course the storyteller exaggerates that part. The very reason I hate coastal weather is the heat and sticky humidity, so why would I be in a coat?) Anywho, the chance to get on the SGR train presented itself last week and without thinking twice, I jumped on it, motivated by the novelty of it all, not procrastinating again and the fact that it was just going to be a weekend thing. In and out before I could catch a headache from the heat. So this is what happens when you get to the station or terminus, which they call the Nairobi Terminus even though it is miles away from the capital: You literally feel like you are at the airport. So maybe they should just call it a rail port. I believe a ton went into building these big terminals and it is immediately evident from a distance. 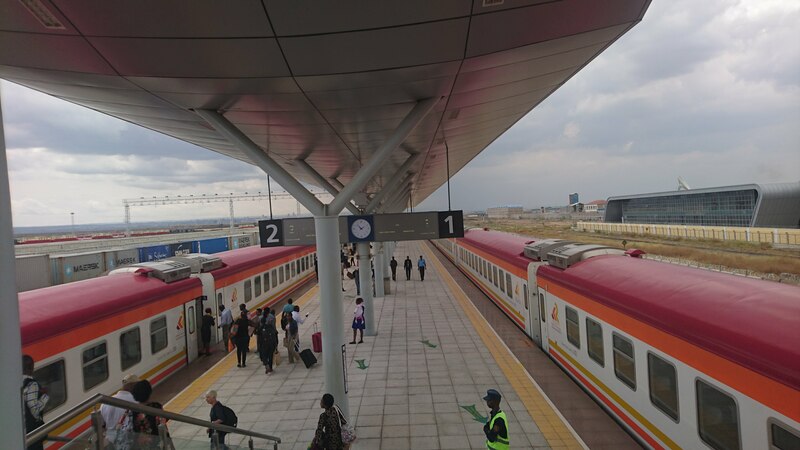 Oh and btw, we call it the SGR I think because we Kenyans love short and snappy names for everything, but I was trying to explain this to an American and she was like, oh you mean the Madaraka Express? And I was like, eeeerrrr, oh yeah… no one calls it that here though. I could hardly even remember that is what it was dubbed last year. Different strokes. The Nairobi Terminus is designed in the shape of two trains moving towards each other, apparently with a load between them both. Lol. Makes no sense but very beautiful either way. The first stop before getting into the terminus is a tent, where you place all your belongings on a platform and step away, and then the police walk their dogs by them to sniff out any illegal stuff. After the sniffing, you pass through the machine check. I mean, I have never even seen sniffer dogs at JKIA! 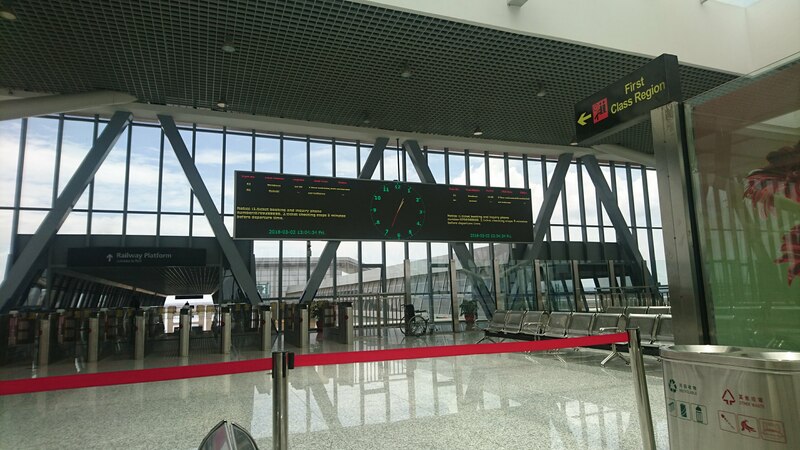 After this point, you can take pictures at the beautiful front then walk into the terminus for ticket checking, making sure you have both your ticket and national ID. There is additional drama that is attached to ticket booking btw. I was going in a group, so I did not experience the actual drama since this work was done for most of us by the leaders, but I heard the horror stories. Apparently tickets get booked like hot cake online. If you make a mistake and tarry, you miss a spot within a few hours. A member of the group even got a ticket indicating the wrong date of travel and had to get this changed last minute. At this first ticket check, they are not super keen on the dates and all. Once you are through another machine check and into the building, you go up a flight of stairs (or escalator) to the expansive waiting area. Again, like an airport, people get here hours earlier, because this train does not wait for Kenyan timers. So after chilling for forever, just chatting, the gates to board the train were opened at 2pm. This train had just arrived from Mombasa at around 1. The first folks to board are the first class peeps who pay a whole 2,300 Kenya Shillings extra for that extra space and comfort. Us KSh 700 folks board shortly after. This is the point your ticket is scanned for you to gain entry into the final stage. And this is also the point you are finally singled out if your ticket has a problem. Once you are through, you walk across the length of the terminus to the flight of steps that lead you down to your coach. The SGR staff are everywhere, directing passengers to the correct coaches. Mind the gap and enter the train. The first thing that hits you is the air-conditioning. Even locating the seat numbers is very much plane-like. The difference is you are walking through a much wider space and the seats are much more and arranged differently. One side sits four people facing each other and the other has six people, with just a tiny “table” jutting out from the side. There are luggage racks overhead and strip curtains for the windows. You are obviously supposed to sit on the seat allocated on your ticket, but if you can make arrangements with someone else to switch, well and good. At exactly 2.30PM, the train started moving, gradually picking up speed. This train’s speed indicator was not working correctly on the screen, from what I gathered, but if the the one from the trip back was anything to go by, we were going at about 110km/hr. The trip is mostly noiseless. You don’t even realize you are moving that fast until you look at the ground just below the train. It is quite smooth the ride. So smooth, some clown in our group convinced one girl that the train had no wheels and it was just sliding on the rails. And she actually believed it. LOL. Pretty soon, you are past Athi River station, gliding through vast savannah and sometimes crisscrossing the old railway. At other points, you are parallel Mombasa road. If you pay attention to the road for long enough, you will spot a random SUV trying to beat the train. But that effort is always thwarted by any of the many trucks trudging through the road. This railway passes through 7 stations and 23 substations (I read, didn’t count myself. Relax.). I only managed to spot five I think. The 7: Athi River. Emali. Kibwezi. Mtito Andei. Voi. Miaseny. Mariakani. If you are really bored and peer into the wild around Tsavo, you will see some elephants. At around Voi, I think, we whizzed past the other train headed to Nairobi. At first, I thought it was moving, but that would make no sense, as my seat mate explained. It has to stop and let the other pass before it proceeds to its final destination. At every station we passed, there was staff standing by, I don’t know for what purpose. 😀 We also went over many elaborate bridges but I was stupid enough not to realize this until I read about it. In the train, the train staff will push through trolleys with food, but this food is nowhere near free. BRING YOUR OWN FOOD, BRETHREN. Either already in your tummy or for consumption along the way. The toilets are great, but they block sometimes. They are designed pretty much like plane ones. And just like on the airborne ones, you will always find a rando who will not close the door shut to turn the light red and you will catch them off-guard seated on the toilet. And then they will act offended when they are the ones who did not utilize the lock as clearly instructed. SMH. The coach also has power sockets at one end, but that’s not super helpful if you are sitting near them. So you either go stand there and charge your phone or forget about your phone altogether until you have reached your destination. (I need a new phone!!! Where art thou, Sony XZ2?!) You will also be advised to not move from coach to coach, but please, you will move, especially if you know people in other coaches. If you do not move, you will not be super comfortable, unless you are in the 3000 shillings crowd. We got to Mombasa at 7.15PM, so that’s like not 4 hours flat, more like 5. Like I said, you get used to the speed that you cannot automatically detect if the train has just slowed down, or has actually stopped, unless you look at the ground by it. This terminus has a huge tower jutting into the air above. It is designed to represent ripples and waves. Does not makes sense to me either but who cares, it’s awesome. However, it only hits you how much more tinier than the Nairobi one it is on the trip back home, because you will not find a place to sit even when you are pretty early. And there will be queues in the only washrooms in this terminus. he You have plenty of time to study the place and just think about what you could do with all the idle land lying around the terminus. Buroti maguta maguta. The trip from Mombasa started at 3.15pm and ended at 8.20pm. Again 5 hours. Let me stop there for now. I will not be ashamed to say I have never boarded a train. I am a village boy up from central. I didn’t get the hype about SGR, reason why I have not even botjhered. Or maybe I am just a lazy broke bum. But after this, maybe I will adjust my resolutions for 2018 and fit in a madaraka express trip doen coast. Even maybe go to the malindi national park. It seems I am not the only one who sees land and salivates. Like this vacant space next to Magna Hotel opposite village market. Buroti maguta ta nndurume. You did an excellent job with photos. The sunset and the clouds especially. You really should do more pieces on travel writing. Travel more tafadhali!! !